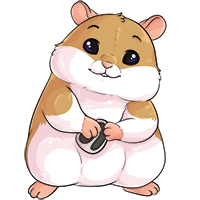 Hamsters the Custom Common Experiment #333 has won the Pet Spotlight! So so cute! Congrats on the win @Bliss. This made me laugh out loud, "Said vets often spend their lunch hour digging through a bag of nacho chips like there's gold at the bottom. Hypocrites." literally the cutest thing on this website oh my gosh! At first I thought it was a Hamtaro fan pet, but seeing that it's an educational page about hamsters is even better! Super super cute :D Congrats!!!! I have got hamsters too and I make big cages for the hamsters I have adopt from the pound. OMG he's gorgeous! Never knew hamsters would/do eat meat and fish, learn something new here every single day! WTG on the win! @Bliss Congrats! Awww... Agree with the others - he's just adorable! This pet has no right to be this adorable! Congrats on the win! Oh gawd this is entirely too precious. Beyond adorable profile, helpful info and well done TC too. This is really cute, and love how it gives some good tips for keeping a happy hamster, congrats! As someone who owned hamsters as a child....this brought me back. This is awesome.